Jeremy Goldman is the founder of Firebrand Group and the author of the book GoingSocial. Let’s be honest: it’s hard to find competitive advantages these days. You’ve got access to LinkedIn, an incredibly potent professional tool, which is great – until you realize that all of your competitors have access to that same platform. I’ve always identified with Columbo, the fictional TV detective who seemed a little dim, yet constantly outwitted the subjects of his investigations. That’s probably because I’m keenly aware that on any given day, I’m going to be competing with someone smarter than me. When I’m in a situation like that, I want the other person to underestimate me. The best way to outsmart others when faced with a relatively level playing field? Execute better than everyone else. And the best way to do that is to have a better understanding of platforms such as LinkedIn. From the Connections tab, you can filter by location, so you’ll know exactly which of your connections reside in any particular vicinity. This is especially helpful for you road warriors: when you’re traveling to a new city, you can look to see who you’re connected to in that area. As you’ve realized, scarcity usually fuels demand: I’ve noticed that people are very likely to want to have coffee or a drink with individuals who are in town for just a night or two. Most of us are semi-obsessive with respect to figuring out who is checking us out on social media. That’s why “Who’s Viewed Your Profile” has become one of LinkedIn’s most popular features. Recently, LinkedIn improved that feature even more with “How You Rank,” which enables users to see how they compare to other connections within their networks. At the top of the screen, the user interface displays your rank among your connections, both as a percentage as well as numerical rank, along with whether or not your rank has improved or taken a dive over the prior week. Underneath your rank are two additional tabs: Your Company and Your Connections. These indicate where your profile views rank compared to your coworkers and users you’re connected to. You’re able to quickly scroll through these lists to see which profiles are more and less popular than yours. “How You Rank” can also show you what specific keywords were used in search to find you. Once you know what other professionals are searching for, you can strategize your brand and market yourself accordingly. Once you see how you stack up against other professionals, you can make profileadjustments to give yourself a competitive edge. If you want to know how to design your profile to attract the most attention, you can use the “How You Rank” tab to browse the most-viewed members in your network for ideas. While it’s always nice to find users by doing a general keyword search, sometimes you want to categorize contacts on your own terms. To solve that problem, you can create custom tags that you can use to filter your connections. You can tag people either from the Connections tab or directly from a user’s profile. There are many uses for this feature. When I was looking for speakers for my NYC-based digital networking group, for example, I searched my entire network for “advertising” and “paid media,” and then tagged potential speakers with my custom “advertising speakers” tag. If you’re in sales, you can apply this principle towards cataloging all your prospects. The possibilities with tags are endless. Most professionals I run into consider LinkedIn to be a place to connect with other humans, not companies. But, as my friend Mitt used to say: corporations are people, too. Go to the Interests tab, click on Companies, and you’ll see a list of companies you’re already following. If you want to add more companies, it’s an easy process. For example, if you want to start following Firebrand Group, you would just type our name into the search bar, click on the proper result, and then hit the Follow button. Following companies is a great way to take a look at your competitors, prospects, or industry think tanks. If you see that someone hasn’t had much or any activity in the last few weeks, it may make sense to find their email address and get ahold of them that way, since they don’t log on to LinkedIn often. Just because you’re done attending school doesn’t mean it can’t continue to be helpful as you build your career. Simply visit the Interests tab, and select Education from the dropdown. You can filter everyone affiliated with your college or university in different ways, depending on if you’re a prospect, student, alumni or employer. This is an incredibly helpful trick, as I recently found when I selected the Alumni tab, then entered in the name of my alma mater, Emory University. Afterwards, LinkedIn suggested that I “Explore Careers of 46,695+ Alumni.” From there, it was a cinch to find fellow Emory alumni who are skilled at public speaking, in the NYC area and were first or second degree connections. Referencing that you’re alumni of the same institution as an outreach target makes it much more likely that he or she will be interested in talking with you. Sending a teenager to college in a few years? One feature that’s invaluable is looking to see where a university’s alumni tend to be employed post-college. 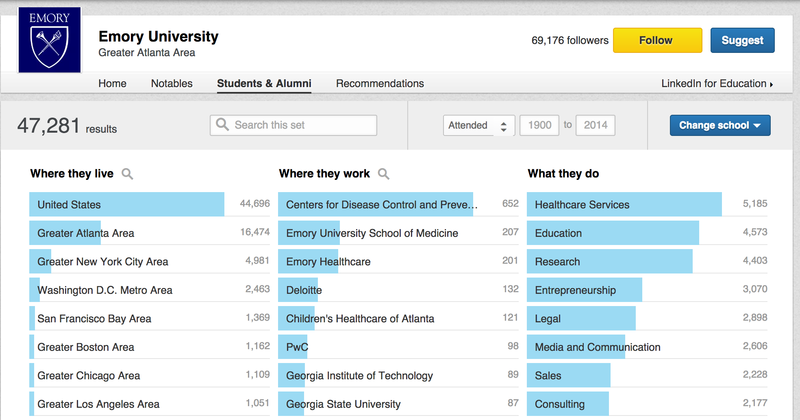 A quick search lets me see that J.P. Morgan, IBM, American Express, and Macy’s are some of the top spots that Emory alumni land in NYC. The above are some of my favorite LinkedIn underutilized features, but these are just some of many. What are your favorite best-kept secrets on LinkedIn?